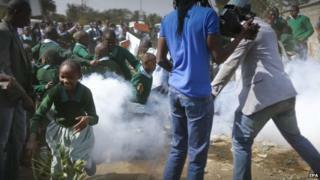 The Kenyan authorities have apologised for an incident on Monday in which police used tear gas against protesting schoolchildren in the capital. The children were demonstrating against the apparent sale of their playground at Lang'ata school in Nairobi. Internal Security Minister Joseph Nkaissery met pupils on Tuesday to apologise and confirm that the play area belonged to the school. Activists had alleged that it had been corruptly sold to a private developer. The pupils, aged between three and 14, had returned to school after a two-week teachers strike to find the playground fenced off. Many joined teachers and activists in trying to push down the barriers that had been erected, before police arrived to confront them. Local media reports said Mr Nkaissery had now ordered the developer to remove the remaining part of the barrier and clear all building materials within 24 hours. The police officer in charge of the operation to disperse the protest has been suspended pending an investigation, the reports said. Several children were taken to hospital after being hurt in the police action. Meanwhile, two activists who were arrested during the confrontation with police are expected to appear in court. It was not immediately clear how the developer came to take possession of the land, which lies less than 5km (three miles) west of Nairobi city centre. The city council, which runs the school, said the playground was public land and made no comment on the legal status of the alleged sale. The Law Society of Kenya is collecting evidence from the school with a view to taking legal action against those behind the alleged land grab.